Last year was challenging, chaotic, traumatic AND a blessing altogether! 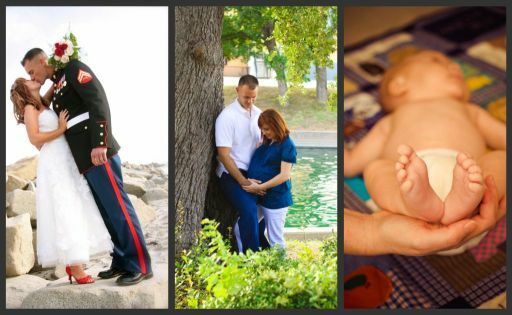 The first few months of 2010 were focused on our transition out of the United States Marine Corps and back into civilian life. To our surprise on January 18, the doctor confirmed our dream to have a family. We had been trying without success for quite some time and were ecstatic about the news! The next memorable day for us was on March 10th when we had our first ultrasound and heard the heart beat. Dace was right by my side and the experience brought tears to my eyes. Our excitement continued to the next month and on April 1st, we drove to Orange County for the day to have an elective ultrasound. Right away, the technician told us wonderful news: we were expecting a boy! We wanted to remember this day forever so we went to the beach and shared our news by writing in the sand of the Pacific Beach. Towards the end of the month, we left California for the last time to finally head home to establish “our roots” in Texas. Dace and I celebrated our 4th wedding anniversary on May 5th, which was the first day I felt Davin’s first big kick! I truly believe it was his way of celebrating with us. On Memorial weekend, we were in an unfortunate car accident. A driver hit us on the passenger side, my side, at a four-way stop. The two doors were smashed in and I was horrified at the thought of anything hurting our unborn baby. Paramedics arrived at the scene and I was taken to the E.R. at Lackland AFB. I think I was more scared than physically hurt and the paramedic that rode with me kept talking to me to calm me down. He asked what we were naming the baby and I told him Davin Troy. He then told me that was his name and I immediately felt reassured. Troy does not seem like a common name to me and I felt that was God’s way of telling me everything will be ok. I was monitored at the hospital for several hours and we went home late that evening unharmed! The summer came and went and before we knew it, we were celebrating our gift from God at our baby shower. My cousin Missy and best friend Heather put our special day together. Many family members and friends surrounded us and the day was absolutely perfect. We had a couple of “delivery scares” in August and on September 2nd, I went to the naval hospital for routine blood tests. I was not feeling good that day and thankfully my sister-in-law drove me back to the hospital after we noticed my blood pressure was elevated. To my surprise, the doctor on duty, Dr. Rumsey, admitted me to Labor and Delivery. I was very shocked, scared and excited all at the same time! My due date was not for another few weeks. However, Dr. Rumsey was very reassuring and coached me through the process. Labor was very difficult and at 3:09 a.m. on September 4th, we finally met Davin Troy Dunn. It was one of the best days of my life and we were so thankful for all the visits from family and friends. I stayed in the hospital longer than expected ( 28 days to be exact) due to severe complications and finally returned home to my new family on September 30th. The first holiday we celebrated as a family was Halloween and we dressed up as a “skeleton family”. Thanksgiving was a wonderful day for us, followed by my favorite holiday, Christmas! Davin also went on his first trip to see Santa! One of our favorite moments of the year was waking up Christmas morning with our baby boy! At the very least, we had an eventful year, but it was worth every moment. We are so blessed with our new addition and cannot wait to see what the New Year brings! I love your blog. I cannot wait to see Davin grow up and see all the new developments in your guys' lives!